Last month, we covered the overall strategy the United States followed in much of its foreign policy and the origins of the wars in Iraq and Afghanistan. We also covered the current situation in Iraq. In this article we will explore the situation in Afghanistan and a major player in the Middle East, Iran. Thought to be the origin of the Indo-European-speaking peoples and the birthplace of Zoroastrianism, Afghanistan has had a long and colorful history. While the land has been occupied at various times by the Median and Persian Empires, Alexander the Great, the Seleucids, the IndoGreeks, Turks, and Mongols and more recently, the British, Soviets, and now the United States, Afghanistan has never truly been conquered. It has been called the “Graveyard of Empires,” because the area is land-locked, mountainous, and littered with easily defendable caves. There is a truism in military warfare that says, “Amateurs study tactics and professionals study logistics.” For the United States’ war on Al-Qaeda and the Taliban in Afghanistan, this conflict quickly became one of logistics. There are three approaches into Afghanistan to bring in troops, supplies and munitions: Pakistan, Iran, and Russia via Central Asia. The route through Iran is impossible in the cur-rent political climate and the other two are in serious jeopardy. Even now, the northern supply route to Afghanistan through Central Asia is being threatened by Taliban attacks. Until recently, United States forces were supplied through Pakistan. However, due to ground attacks by the Taliban, 70% of the supplies brought into Afghanistan through this route have been destroyed. To execute the war in Afghanistan, the United States must secure these supply routes and placate both Pakistan and Russia at a minimum. The war is now at a crossroads. General Stanley McChrystal’s proposal for substantial U.S. troop increases in Afghanistan has triggered a major debate about U.S. policy toward the conflict there, both within the Obama administration and without. Gen. McChrystal’s report did recommend an increase in troop levels by 40,000, but there was another facet to the plan that has not been reported in the media. The McChrystal Plan recommended the troop increase only if there was a change in strategy for the campaign. The in-crease in force levels in Afghanistan is an attempt to change the game in Afghanistan. If there is not a change in strategy, the report continues, the U.S. needs to withdraw for fear that Afghanistan will become another Vietnam. On December 1st, President Obama laid out his strategy for Afghanistan in a speech to the cadets at the West Point Military Academy. The main points are to run Al-Qaeda out of the country, prepare the Afghans to take responsibility for their own security, and to create the conditions for a U.S. withdrawal from the country. 1. 30,000 more U.S. soldiers will be deployed to Afghanistan. 2. Obama is requesting their NATO allies to send the remaining 10,000 troops required. 3. All troops will start to withdraw from the country in July 2011. Second, setting a withdrawal date sends the wrong signal to the Taliban, letting them know how long they have to wait be-fore the United States will be leaving. This will also further weaken the Karzai government in Kabul. The real heart of the War on Terror in 2010 will not be in Afghanistan; it will be in Pakistan, which shares a border with its neighbor to the north. 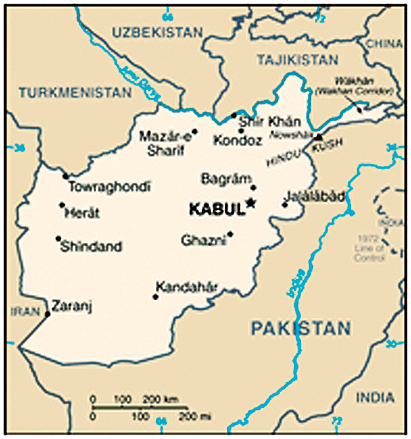 When the United States first entered Afghanistan, it was extremely successful. The U.S. came in with small Special Forces units and worked with the local chieftains in moving Al-Qaeda out of their strongholds in Afghanistan. The problem was that the terrorist bases were moved into the North-West Frontier Province and Federally Administered Tribal Areas in northern Pakistan. This action was taken without any forewarning to Pakistan, a fact they deeply resent. The U.S. has since taken pains in working with Pakistan, by at least notifying the government in advance of any major action, but in many ways it is too late. Al-Qaeda and their Taliban sponsors have gained a foothold in Pakistan and it will be difficult to dislodge them. The major concern with an Al-Qaeda presence in Pakistan is the roughly 30 nuclear weapons the country is thought to have. If these weapons fall into terrorist hands, the results can be catastrophic. To win in Afghanistan, we also need to win in Pakistan. Even if the United State achieves all of its goals in Afghanistan, the threat from Al-Qaeda will not completely disappear. As one senior intelligence officer said in a confidential briefing, “This is not a matter of if the United States is attacked again; it is a matter of when.” The Fort Hood Massacre of November 6th, 2009, and the attempted airline bombing on Christmas 2009 may only be the start of a new round of terrorist acts in-side the United States. 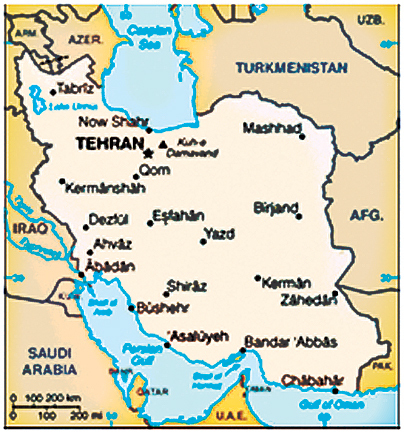 Iran is an anomaly in the area. Many people call them Ar-abs, but they are actually Persian. Iran can claim both Cyrus the Great and Daniel in their history. It was only 1,000 years after these men lived that Iran was conquered by Arab armies and became a regional center for Islam. There is also a rich Jewish history coming out of Iran. The Books of Isaiah, Daniel, Ezra, Nehemiah, Chronicles, and Esther contain references to the life in Iran (then Persia). Jews have lived in Iran for over 2,700 years—since the capture of the Jewish Northern Kingdom by the Assyrians in 722 B.C. From the establishment of the State of Israel in 1948 until the Iranian Revolution in 1979, Israel and Iran maintained close ties. Israel viewed Iran as a natural ally as another non-Arab power in the Arab world. While the two countries did not have diplomatic relations, Israel had a permanent delegation in Tehran which served as an unofficial embassy. Iran even came to Israel’s aid after the Six Day War, supplying Israel with oil and utilizing Israeli oil pipelines to get its oil to market. Up until 1979 the two countries maintained trade relations and even joint military operations. All that changed with the overthrow of the Shah of Iran and the rise of the Ayatollah Khomeini. Since the Ayatollah came to power, Iran is now the most effective counterbalance to U.S. intentions in the region. It is interesting to note that in the beginning of the Iraq War, the U.S. had the support of the Iranian government (even allowing our planes to land in Iran if they had mechanical trouble). This was because Iran was led to believe that the U.S. would support a Shiite-led government in Iraq, becoming an Iranian puppet state, in effect. The Iranian government’s attitude changed once they saw the United States’ overtures to the majority Sunni faction in Iraq. It is interesting to note that Iran didn’t start talking about its nuclear program until they started to feel like the U.S. was dealing them out of the game. The whole discussion about nuclear weapons is not about nuclear weapons, it is about Iraq. Iran would love to see the U.S. lose the wars in Iraq and Afghanistan. The reticence of the Obama Administration and the near-revolt of the Left in Congress are only heartening the Iranians. There is a great fear in Iran, though. The younger members of the Iranian government want to continue to goad the new United States president and publicly humiliate him. The older members in the government remember a time when they publicly humiliated a president (Carter) and drove him from office. They then had to deal with Ronald Reagan. They fear that if history repeats itself, they could end up having to deal with a very conservative American President in 2012. The older members of the government are lobbying for Iran to cut a deal with this president while they can. President Obama is looking for a deal because he would love to be able to bring both these conflicts to an end and let that be part of his legacy. Complicating the situation is Iran’s nuclear program. No country in the P 5+1 group2 or the Sunni-dominated countries wants Iran to have nuclear weapons, but there is no consensus on how to deal with them. So far, the only action they have taken was to issue a joint statement expressing “disappointment” in Iran’s lack of response to a proposal to ship roughly 75 percent of Iran’s low-enriched uranium (LEU) abroad for further processing. Russia, France, and Turkey all have said they would take the material and enrich it for them, but Iran is not excited about giving any of those countries control of its LEU. Not only do they not want to lose control of the material, but they view these countries as competitors for influence in the region. Iran’s response to any outside pressure is to start a program of bluster and delay. Iran’s latest delaying tactic is to insist that the United States unfreeze Iranian assets before any negotiations can move forward. In recent weeks Iran has also instigated a border crossing into a disputed section of their border with Iraq, seizing an oil well; something that has happened before. This latest incident has been telling in that the United States has stated that it will not get involved in this dispute, a move which will only embolden the radicals in the Iranian government. Seeing this as a weakness in the new American administration, Iran is increasing the provocation, threatening to build 10 new nu-clear facilities in Iran rather than dismantling the ones they currently have. This is viewed by many intelligence agencies as mostly bluster. Experts say Iran’s plans to build 10 new nuclear plants is not within its capabilities for years, but Iran President Mahmoud Ahmadinejad said they would build another 10 uranium enrichment plants the size of the Natanz facility already in operation. He says construction of two of the plants will start in a matter of months. Some experts have asserted that Iran simply does not have the industrial capabilities to produce the 500,000 centrifuges required for the country’s stated goal of generating 20,000 megawatts of electricity. Currently Iran has installed only 8,000 centrifuges, far from the 500,000 required for the country’s new program. Of those 8,000, only half are currently producing reactor-grade uranium. Iran has further raised the ante by test-firing a new two-stage Sajjil-2 missile. This missile is capable of hitting Israel and parts of Europe—a provocation designed to prevent any military strike against it. Reports are also coming in that Russia is helping Iran with its weapons technology, while smugglers from Taipei are bringing in weapons-grade material from North Korea. All that is lacking is a nuclear trigger. While most countries discount many of these moves as mere saber rattling, Israel does not have that luxury. Israel believes that Iran’s nuclear program has matured to a point that it will affect the survival of the Jewish state. Also, an escalation of tensions between Iran and Israel could quickly spiral into major crisis at the world’s energy nexus, the Persian Gulf. Yet, with all this at stake, recent moves by the Obama Administration have awakened fears in Tel Aviv that if the threat of nu-clear annihilation is used on Israel, the United States may not come to the aid of the Israelis. This is problematic since only the United States has the re-sources to simultaneously strike Iran’s nuclear facilities and engage Iran in the Strait of Hormuz. This is a fight the United States does not want to fight today. It would much rather hope that the internal discontent in Iran will result in a regime change without any outside intervention. The year 2010 may see Iran preparing for war, Israel looking to preempt it, the United States trying to avoid it, and the Russians jockeying for position to make sure it is the true beneficiary of a conflict. These facts are looming large in the war rooms of Israel. Next month will be the conclusion of this series, focusing on Israel and Syria. 1 Barry, John, and Thomas, Evan, “Obama’s Vietnam,” NEWSWEEK, Feb. 9, 2009. 2. P 5+1 is a reference to the permanent five members of the UN Security Council plus Germany. 3. Farah, Joseph, G2 Bulletin, WorldNetDaily, Dec. 2, 2009.